Before you get offended, I should say that the "rosemary" in question is a plant, not a person! I love cooking with rosemary and bought some to pot a year or two ago. I stuck it in a large terracotta pot and placed it in a spot by the fence that gets lots of sun. It would seem that you have to engage in an activity called gardening, or "upkeep," if you will, in order to have healthy, well-adjusted plants. Presently, there could be a band of rabid chimpanzees in there, waiting to grab a small child or Pomeranian in, never to be seen or heard from again. Should I just hack off everything down to the soil? I need some advice. I hate to trash it, as there is fresh growth....if the rabid chimpanzees will let me get to it. What do you think? Please weigh in, readers! We too have rosemary in our garden and it does quite well with just a little maintenance. As with any herb, it is good to pick or give it a little hair cut from time to time. I would just cut off the dead branches as well. 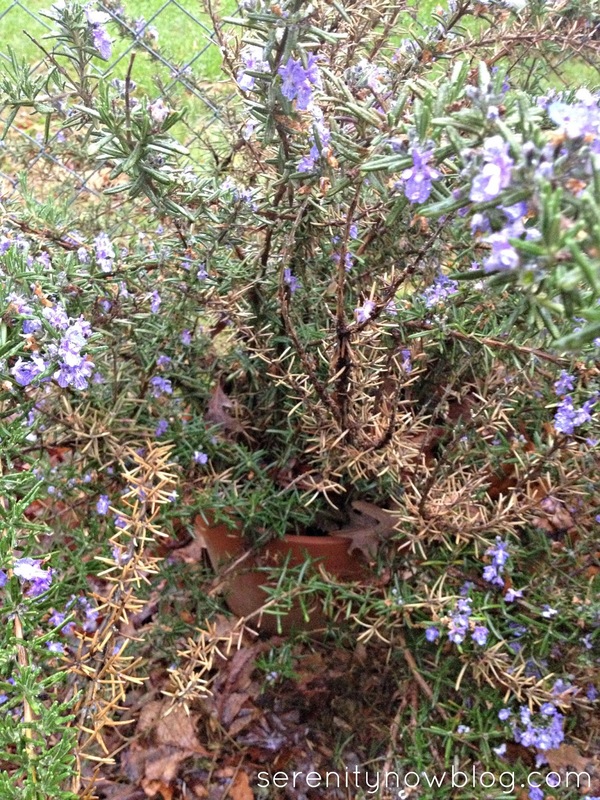 Rosemary is very hardy, should grow fuller in no time. What a hairy growing herb you got there! I sort of like the rustic look but if all else, take away the dead branches, maybe it'll grow better afterwards. You need to cut back the dead branches and the flowering branches. The flowering branches are going to seed and will be bitter. The new growth will be tasty. :). Good luck! You just need to cut it WAY back and then prune it occasionally! I would cut it as far back as you can handle. If you snip it every once and awhile it'll keep beautifully. I agree with the advice you've received. Plant it in the ground in a sunny spot and prune off all of the brown branches. I love the smell of Rosemary!